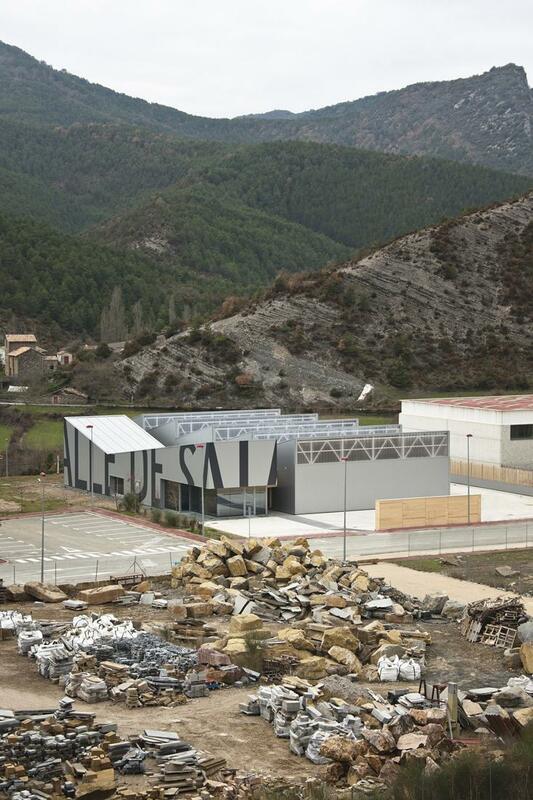 El Centro Polivalente Valle de Salazar es un iniciativa del Gobierno de Navarra, enmarcada dentro del Plan Estratégico de Desarrollo del Pirineo, encaminada a dotar al Valle de un centro mixto de negocios y de equipamientos públicos que centralice servicios a las empresas y a la comunidad. El Centro es un nodo activador a la escala del Valle de Salazar, que es la escala de las infraestructuras lineales que lo articulan (el río Salazar y la carretera NA-178), de manera que el edificio se plantea como un HITO INFORMACIONAL que se asoma AL BORDE DEL CAMINO para conseguir el principal objetivo: identidad y visibilidad. La TIPOLOGÍA es capaz de albergar usos públicos, como una sala multiusos y la administración y gestión del Valle, así como la activación del tejido industrial y comercial de la zona con los espacios productivos y locales propuestos. El tipo es resuelto con una secuencia de tres bandas, de sección cambiante, que flexibilizan al máximo los usos futuros y las conexiones transversales. El Centro está enraizado en el CONTEXTO local: por el uso de las tradicionales cubiertas inclinadas y la tipología industrial del entorno inmediato, por la puesta en valor del paisaje de transición del Valle, y por la triple materialidad utilizada: chapa de acero (contexto inmediato industrial), madera de pino (contexto económico-cultural) y piedra caliza de la zona. Centro Polivalente Valle de Salazar / Multipurpose Centre Valle de Salazar. Parque empresarial, Iciz (Gallués). Navarra. España / Bussiness Park, Iciz (Gallués). Navarra. Spain. 1er Premio Concurso: Mayo 2010 / 1st Prize Competition: May 2010. 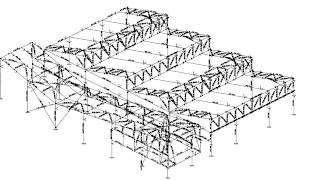 Proyecto y construcción: 2010-2011. 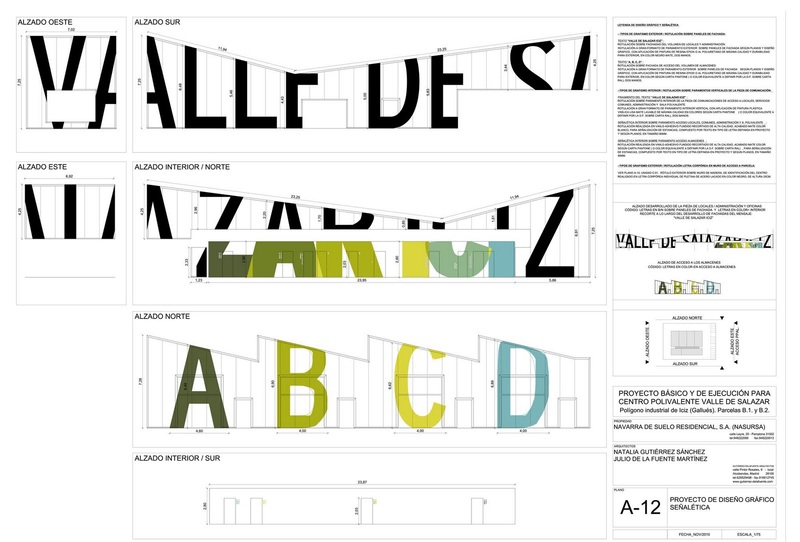 / Project and construction: 2010-2011. Navarra de Suelo Residencial, S.A. Gobierno de Navarra. 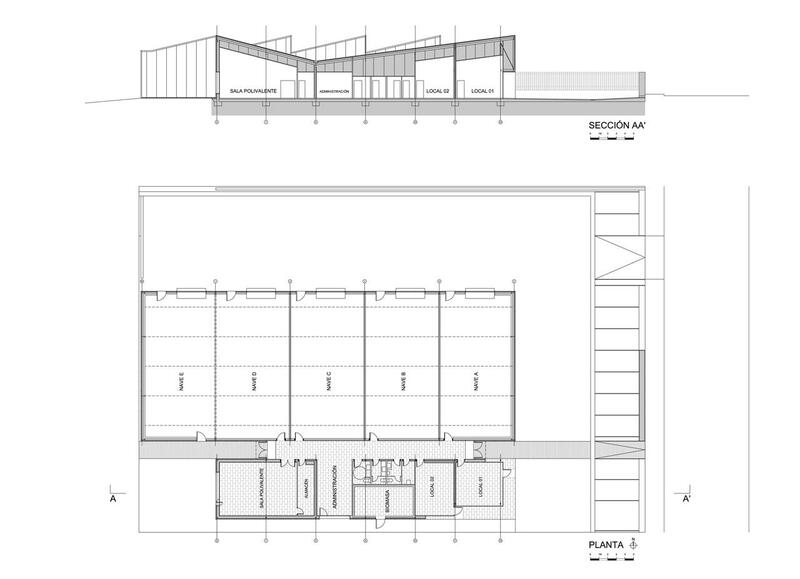 Arquitectos técnicos / Surveyors: Asier Zarrazkin (obra / works), Jorge Carrión (proyecto / project). Instalaciones / Services engineers: Insercon, S.L. Aplicación tipográfica / Graphic design: Tres Tipos Gráficos, S.L. Luciano Elcarte, S.L. (Construcciones Elcarte). 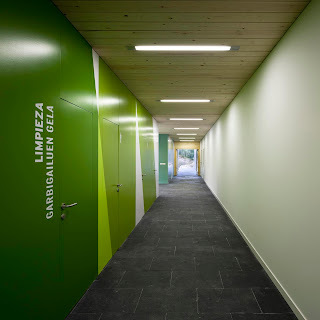 / Pinewood, natural stone and the main material used is ACH Mineral wool panels, composed of two high quality steel sheets with a Silver Mettalic finishing and an insulating core of mineral wools, by Saint Gobain. The Multipurpose Centre of the Valle de Salazar is a initiative of the Government of Navarra, framed within the Strategic Development Plan of the Pyrenees, designed to give the Valle a joint center for business and public facilities to centralize services to businesses and the community. 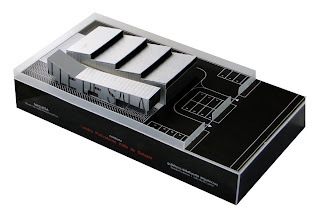 The functional aim is to host development infrastructure for the Valle de Salazar, that would allow for accommodating both functions and activities of information, diffusion, social facilities and administration of the Valle complex, like the industries and shops that could reactivate its economic tissue. 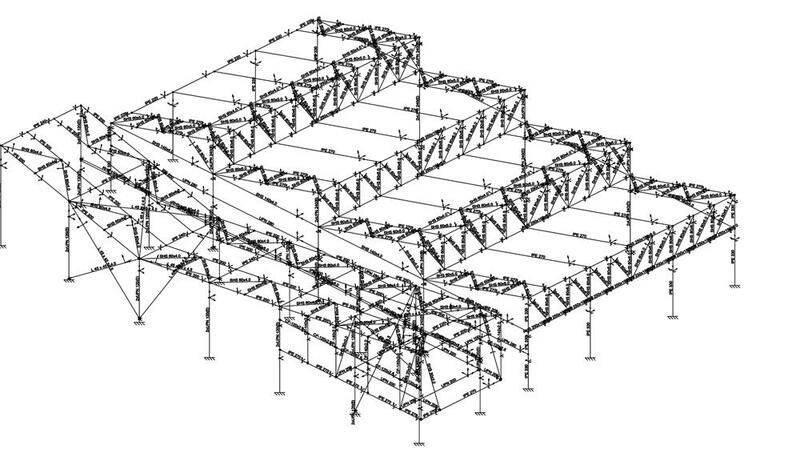 The scale of this programatic frame is the territorial scale of the entire Valle de Salazar. 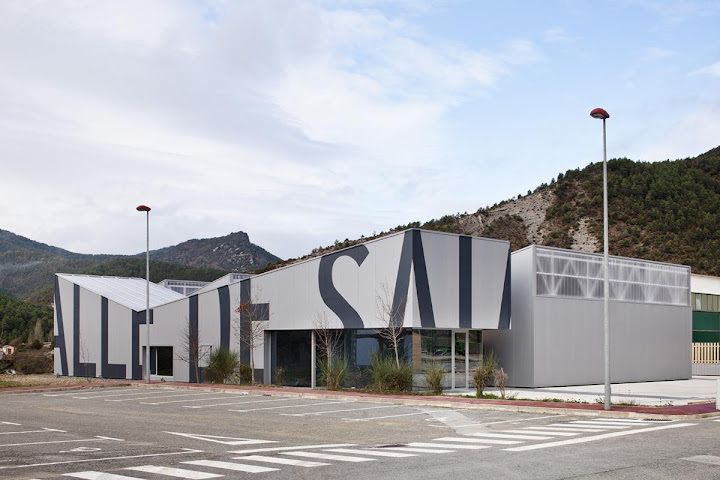 The Centre is an activation node to Valle de Salazar scale, which is the scale of its lineal infrastructures (Salazar River and the NA-178 road), so that the building is considered an INFORMATIONAL LANDMARK that stands out ON THE EDGE OF THE ROAD in order to reach the principal goal: IDENTITY AND VISIBILITY. 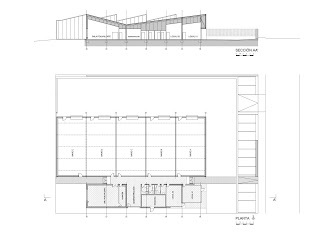 The building is integrated successfully into the environment that respects and brightly resolves the apparent contradiction offered by the place. The building is equally stressed by the industrial environment requirements and by a landscape of unique beauty that surrounds it. 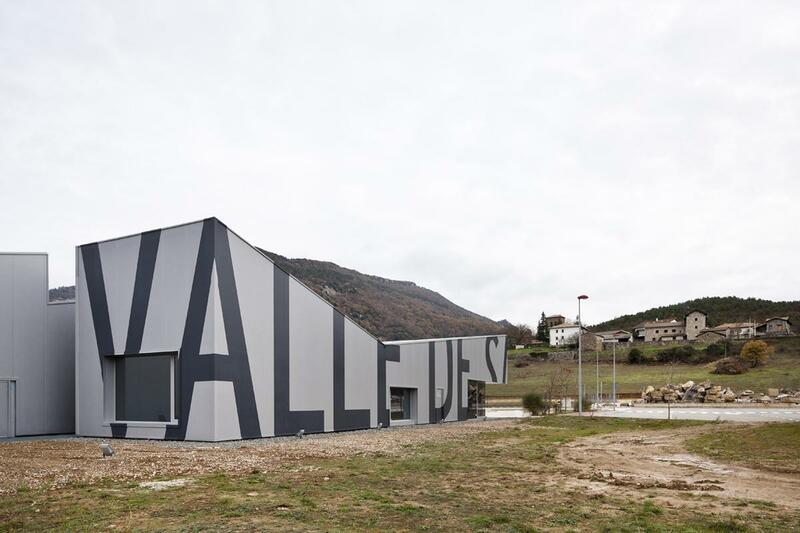 The Centre is a precise insertion into the landscape and the local CONTEXT, through the use of a traditional pitched roof structure of the Navarre Pyrenees and the industrial typology of the nearest surrounding, also, through the qualities of the landscape of the Valley, improving the visibility of the features of the middle Valle landscape, between the two main landscaped nodes which are in the South, the foces of Arbayún and Lumbier, and in the North side, the Selva de Irati. Finally, the building is integrated in the site through the three materials applied: steel sheets (industrial context), pinewood (economical and cultural context) and the local limestone (local and sustainable context). 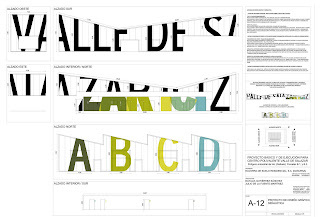 The program has a hybrid nature and comprehends public functions (multipurpose area and public administration of the Valle) and private ones, such as commercial and industrial uses (production plants, warehouses and retail spaces) through a TYPOLOGY which works out with a sequence of three stripes, with a changing section, very flexible for future functions and transversal connections. The central stripe or the join stripe of the complex works as a temperature controller according to the summer-winter cycles. 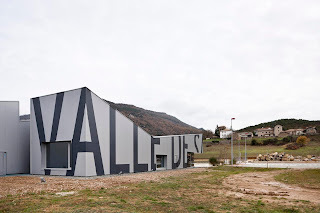 Energetically, the building gets the highest rating possible, thanks to the generation of heat through a biomass boiler, which appears a very appropriate solution due to the location in the Pyrenees and the important local timber industry. Because of the local climate, the building has a mineral wool insulation 120mm thick, well above what is required to ensure an optimal energy performance and minimize maintenance costs.